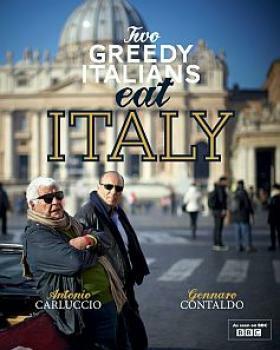 With all the Italian inspired recipes on my blog, it’s perhaps not a surprise that I am already a fan of the Two Greedy Italians (Antonio Carluccio and Gennaro Contaldo) and I’ve been waiting for their new TV Series ‘Two Greedy Italians eat Italy. The two protaganists seem like cheery, down to earth people. The sort that I’d like to have as my uncles, if I was Italian. And, the TV series is inspirational. This book is the companion to the series. For me, the Two Greedy Italians strike the right balance between inspirational new things and recipes I think I can make myself but learn how to do better. And I like the mixture of food and culture that you find with the Two Greedy Italians which I think is what defines culinary heritage and which is evident in the work of authors like Claudia Roden and Elizabeth David too. The type of recipe book you enjoy is something I believe is quite personal – and will depend on your cooking experience and your food interests. But, my recipe bookshelf already has the first of the Greedy Italian cookbooks and Carluccio’s Mushroom guide. So I was delighted to be sent a review copy a few weeks ago of the latest book from Quadrille, released on 12 April 2012 – ‘Two Greedy Italians eat Italy’. Now, like many of my favourite cookery books this has ended up being bed time reading for the last week or so, and as a consequence I haven’t written the review till now. The photography in this Two Greedy Italians book like it’s predecessor is superb and inspiring. There’s a vibrancy and passion in what you see…they say the French cook from the Head while the Italians cook from the Heart – and that is reinforced in this book. But unlike some recipe books with stunning photography, this one has recipes that I think I will be trying soon because the ingredients are for the most part easily available in the UK and nothing involves complicated kitchen utensils. I found the geography just a little confusing. I don’t know Italy very well. I am off to Tuscany in a few weeks but to date the only part of Italy I’ve visited is Veneto and Lake Garda. I haven’t even been to Rome. This book uses a broader regional description by talking about ‘Mountains’ ‘Coast’ and ‘Rivers and Plains’. But then, back to the familiar North/South Italy divide. I’m geographically challenged at this point. I need a map! But my personal shortcomings shouldn’t detract from what is a beautiful and informative book. The recipes are for the most part very accessible and the sort of things I will try at home I love the ‘Pane Caliatu’ – a bread, tomato, olive and caper salad. And the ‘silk handkerchief pasta with pesto’. There are some great tips too – for instance in ‘Bucatini all Amatriciana’ ‘Use pecorino cheese here rather than the posher (and dearer) Parmesan’. There’s an endearing sense of realism here that is sometimes missing from cookery books. I’m really looking forward to the ‘Two Greedy Italians Eat Italy’ TV show which starts later this week where we can see Carluccio and Contaldo in action! How can anyone not enjoy Two Greedy Italians eat Italy? – it’s a book to to read, to learn a little about Italy and to cook from. The TV Show for Two Greedy Italians Eat Italy is also about to start, will you be watching? I know I will! ooh lovely. I am so looking forward to the new series that accompanies this book. Tuscany is fabulous and home of pecorino, so I’m sure you will get the hang of it when you are there!